LAUREN BACALL--BY MYSELF AND THEN SOME and TALLULAH--THE LIFE AND TIMES OF A LEADING LADY, by Joel Lobenthal (both published by Harper Collins), are new books that deal with remarkable actresses whose impact has left its mark on generations of women, part, present and future. Tallulah Bankhead, who died at age 66, was a living legend of the entertainment world. In this revealing biography we see her with all her warts and insecurities revealed. This uninhibited scamp from a monied southern political dynasty became a reigning international star. She was an example of a rare talent beset by personal problems that both shocked and titillated her fans. We get to know first hand the world she inhabited, and in so doing realize that despite her self-destructive behavior she was true to herself in her pursuit of excellence in the roles she played, and in the friendships she made. She was a free spirit, sexually and otherwise, who paved the way for the independent women of today. represents the emergence from a cocoon to a butterfly that soared. Her life was radically different from Tallulah's. However, there are some similarities between them. Bacall had a strong family background that supported her all through her acting career. She met the love of her life, Humphrey Bogart, in her first film To Have and Have Not. It was a storybook romance that fulfilled her dreams both as an actress and woman until his tragic death in 1957. Bacall took part in the struggle against the Hollywood blacklist and kept her integrity both politically and personally. Her steadfast democratic beliefs brought her friendships with many of the leading figures of her time. Never wavering from her ideals, she chronicles with humility and purpose the events of the past 25 years in this updated silver anniversary edition. I found both of these books exciting, informative and inspirational. I too am in my 80s and have shared many of the events of the years past. We can learn much from what has been that will help clarify what lies ahead for us. 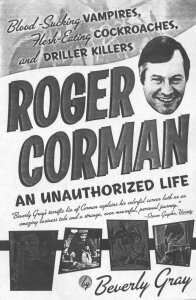 Now to another Hollywood book, ROGER CORMAN--AN UNAUTHORIZED LIFE by Beverly Gray (Thundermouth Press), which explains the journey Corman took en route to becoming king of the exploitation film. His story brings out the good, the bad and the beautiful in Corman's quest to score big at the box office by catering to the fantasies and dreams of the viewing public. While doing this, Corman encouraged young filmmakers to take chances and experiment, keeping his eye all the while on his main objective: making money. This is an inside look at the movie business as it is really played on the rialto. It is a welcome and insightful study of Corman's ups and downs, triumphs and failures, and should please every fanatical film-addict out there.